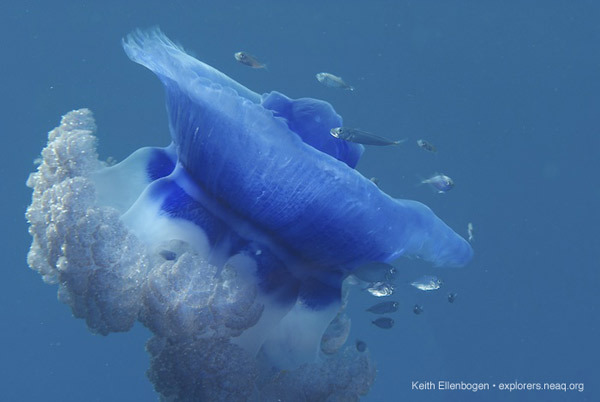 This is the first post in a series of daily photographs from an expedition to Totoya Island in Fiji by Keith Ellenbogen, an underwater photographer and frequent contributor to the Global Explorers Blog. 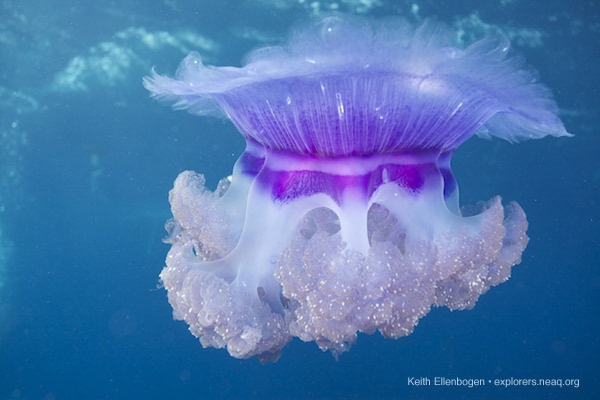 Keith's first photo of the day is a species of jelly often called squishy (Cephea cephea). They can grow up to 18 inches in diameter. The species has a wide distribution throughout the Indo-Pacific, including the Red Sea. Here's another shot he sent. Stay tuned all week for more of Keith's images from Fiji! Please join Keith Ellenbogen, underwater photographer, and Dr. Stacy Jupiter, Director of the Wildlife Conservation Society's Fiji Country Program, on an upcoming expedition in Fiji. From June 1 to 8, they will be working with the Pacific Blue Foundation, Wetlands International-Oceania and the Waitt Institute to conduct initial surveys of the Totoya Island reefs. Sections of this remote reef are considered sacred by island villagers and are proposed for formal protection in recognition of World Ocean’s Day. [You and your family can come celebrate World Oceans Day on Sunday, June 5, with free activities, giveaways and seafood tastings at the Aquarium]. Lying in the oceanic waters of the archipelago far from the influence of the central Fijian Islands, the reef holds exceptional value for cultural conservation as well as marine resource conservation. The researchers will also conduct marine and terrestrial resource awareness workshops with local communities. The expedition will provide a rare insight into a nearly pristine coral region in the eastern Fijian Islands. There is a possibility that unidentified and/or rare marine wildlife will be discovered and photographed. The team will be supported by a high tech research vessel. Posts and photographs will also appear on National Geographic’s News Watch blog page throughout the expedition.